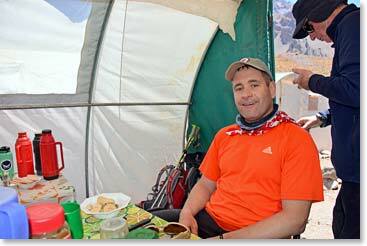 Hi everyone, this is Trevor calling 14,400 feet on Aconcagua. It’s a beautiful day; the sun is just going down behind the mountain range. It’s kind of a relief. It is pretty warm up here, there is no snow and very little wind. We are resting and relaxing. Is it ever awesome up here! 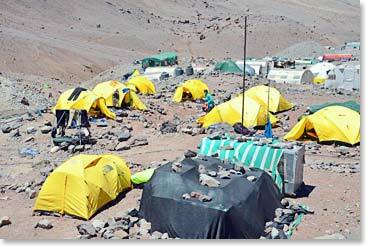 We got into Base Camp last night and found out that the satellite phone antenna had snapped in half. So I couldn’t make an audio feed yesterday but it is kind of Mickey Moused together now. I’m feeling really good. For a day and a half I had a lot of indigestion and diarrhea. But I’m back. So working out very well, feeling strong. We are going to do a climb tomorrow half way up to camp Canada and back down. That will give us some more time to get over the immune problems. We are doing really good. It is amazing up here. I just want to tell everybody that I am thinking about you all. Everyone who has helped me get here and who is rooting for me. Also it’s amazing to be up here and I hope that the YWCA Lethbridge district is raising lots of money. I hope that domestic violence can end we can all win together! Over and out, we will talk to you tomorrow.